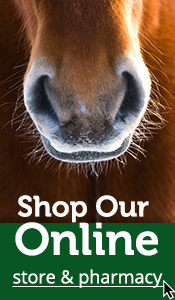 Alpine Animal hospital is dedicated to enhancing your horse’s overall health and longevity. The regularly scheduled wellness visits will maximize your horse’s good health, happiness, fitness and continued performance. The heart of these programs is a scheduled annual physical examination of the eyes, heart, lungs, skin, musculoskeletal system, coat, oral cavity, and digestive tract. The key is disease prevention and early detection of health challenges. We are equipped to provide intravenous fluids and most laboratory results on site. Emergency care is provided on a 24 hour basis. We provide herd health assistance and management for our local beef cattle clients including calf ICU and hospitalization, and herd health pregnancy, artificial insemination and rectal palpation visits. We offer emergency dystocia, cesarean sections at our hospital and in ambulatory situations where ranch facilities are present. We offer select surgical and medical services and care to our procine producers and herd testing for OPP in sheep and CAE in goats. Alpine Animal Hospital also cares for pet camelids as well as fiber producing animals and brood stock.